This might sound odd, but I was really shocked when I became seriously ill because of HIV. I was even more shocked when it turned out to be tuberculosis. I was diagnosed with HIV in the early 1990s. At that time, there was only one drug – AZT – and I was sure that HIV would kill me within about ten years. Well, by the summer of 1994 nothing had happened. My CD4 cell count was just as high as the day I was diagnosed and, to be honest, I felt healthier than ever. It really felt like a kind of phony war – the regular clinic visits for tests were nothing more than a minor inconvenience, and I even dared to think that I might be one of the handful of individuals I’d read about who remained healthy with HIV for years on end. With these thoughts in mind, I didn’t pay too much attention to a newspaper report I read about the first increase in tuberculosis cases in the UK since vaccination, effective antibiotics, and improved housing and nutrition came along after the last war. I wasn’t even concerned when I read that many of the cases involved people with HIV. I also felt reassured because I’d had a tuberculosis vaccine as a teenager. And on top of it all, I just felt so healthy. The first symptom was a mild, dull pain in my lower right chest. I felt certain it was just a pulled muscle and carried on as normal. I wasn’t alarmed when I started waking up in the middle of the right with a light sweat on my forehead. It was summer, after all. And I also found an easy explanation, simple tiredness, for the severe breathlessness I experienced on my 16-mile Sunday run. It was, however, much harder to explain away the temperature of 104 degrees I awoke with the following Monday. 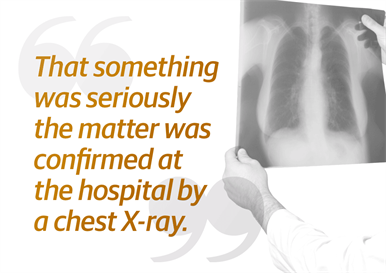 That something was seriously the matter was confirmed at the hospital by a chest X-ray showing a mass of fluid on my right lung – exactly where the pain had been for the past few months. Initially, I was treated for bacterial pneumonia. PCP pneumonia was ruled out as my CD4 cell count was about 500. I didn’t get any better. Further tests over the next few days, which involved draining over two litres of fluid from my lung and a biopsy, confirmed that I had tuberculosis. How could I have got tuberculosis? I asked myself. The answer was simple, I was HIV-positive and even the very mild immune damage I’d experienced was enough to undermine whatever protection my childhood vaccination offered and leave me vulnerable to infection with tuberculosis and the development of disease. I was physically and emotionally wrecked. In the space of a fortnight, I lost a stone in weight and became very weak. I had to rely on my partner and friends to undertake household tasks for me. But just as severe was the emotional impact. The combination of anti-tuberculosis drugs quickly controlled my symptoms and, as I was careful to take every dose of my six-month course of treatment, I was completely cured. Although my CD4 cell count fell by about a half to 250, within six months I was able to run just as often and as far as before, with only the very occasional twinge of pain in my chest to remind me of the scarring caused by the tuberculosis. But the emotional impact was much more permanent. I realised just how serious HIV was, and accepted for the first time that I’d probably have a series of severe illness over the coming years before a premature and inevitable death. As I result, I left work and planned as pleasant as possible a retirement for my last few years of life. It hasn’t quite worked out like that, thanks to the anti-HIV drugs I’ve been taking since 1998. But in summer 1994, effective HIV treatments, and the hope that they’ve brought for me, were a very long way away. Help us to support people like Nick and make a donation to NAM today. Thank you.